In August 2018, California Proposition 65 instituted new labeling requirements, where specific chemicals triggering the hazard must be listed. This new take on “Prop 65” goes beyond the previous requirement to generally label a product with the traditional warning when Prop 65-listed chemicals are present in a product at levels that may present a concern for the consumer. The update requires that companies identify the specific listed chemical that is in their product, the specific concern: carcinogenicity, developmental toxicity, or reproductive toxicity, as well as the exposure risk of that chemical. To understand the chemicals in your products (and which substance(s) have triggered the warning), you often have to engage your vendors or suppliers to provide formulation data. This can be difficult as these ingredients are often proprietary to the supplier. Vendors and suppliers need to trust that their chemical ingredients are secure. Scivera acts as a trusted third-party allowing vendors and suppliers to enter chemical information and prescreen those chemicals before sending them in redacted form downstream. This means that they can identify problematic chemicals, search for and screen safer alternatives, and share the assessment results while protecting confidential business information. 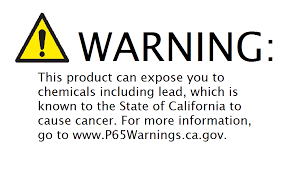 With the new changes to CA Proposition 65, participants also need to understand why the substance(s) are triggering the warning. This means, you need to understand the characteristics of the chemicals in your products. Scivera’s team of Board-Certified Toxicologists have reviewed thousands of chemicals and their human and environmental health profiles. As a subscriber, you have access to this traditionally costly information in a simple and cost-effective way, allowing you to better understand why a substance may be triggering a Prop 65 warning and explore safer alternatives. SciveraLENS Rapid Screen helps you manage the substances in your supply chain, identify chemicals included in regulations like Prop 65, and better understand the characteristics of those chemicals to protect your brand, your workers, and your customers. Scivera can also help you dig deeper and conduct exposure assessments to identify whether or not your chemicals require labeling. Subscribe today to Rapid Screen to implement cost-effective and improved chemicals screening strategy for the revised California Proposition 65.